A median offset ? What's that? 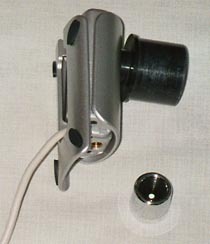 If you put a cap on the adapter of your camera so that it is hermetically sealed, you will see that the images acquired are not black but dark gray and have a characteristic pattern. To convince yourself, increase the gain from your webcam and you'll see vertical lines along the image. This may seem strange because light has not been able to reach the sensor and the very short exposure time (about 1 / 33 of a second) could not produce a visible heat signal. The explanation is simple: to avoid loss of information after scanning (step in which the amount of light captured by each pixel is coded in binary in order to get a digital image), the webcam truncates the intensity values previously found. The result is an image with a useful signal (the planet in our case), and an alias, commonly called "offset". How to make an offset image? The offset video must be recorded during the night, just after the imaging session (preferably just after the acquisition of each movie if you're used to changing the settings between two videos...). To achieve the offset video, block the front of the telescope with a mask and make a video of a few seconds duration without changing any settings that you used to film the planet. 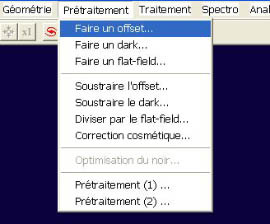 Then in Iris, open the "AVI conversion" dialog from the "File" menu. Indicate first the location of your .avi file on your hard drive. If your video is in B&W, check the option « Black&White » in the type of images exported. At the "Panchro band output file name" option, give the name "bw_offset" to the video which will be produced. Uncheck the "Remove duplicated images" box and click on "Convert".